Sign up for our newsletter at https://Evolvement.io. Evolvement is a podcast hosted by Nye that revolves around Bitcoin, cryptocurrency, blockchain technology, and how these play a role in the current financial models and economic systems of the world. Welcome to the Security Token Series Hosted by the Evolvement Podcast. In this series, I hope to bring you the best quality guests and information around the newly emerging security token industry. The goal is to educate the audience on why security tokens are important to the ecosystem and how they will play a role within crypto. 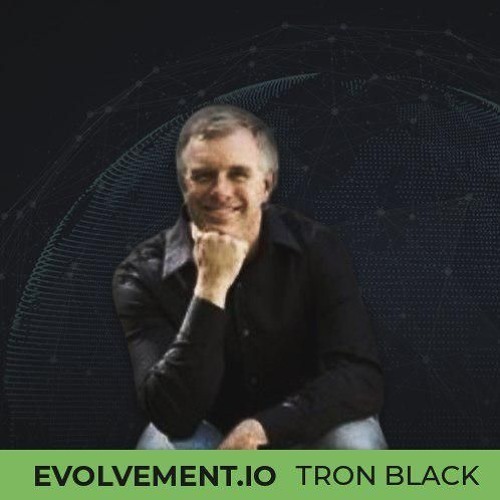 In this episode, I sat down with Tron Black, the lead developer of Ravencoin. We discuss how he got involved in cryptocurrency and Bitcoin, what inspired him to get into the space, and why he got involved with Ravencoin. We also discuss how Ravencoin was created and the role it plays in the Security Token market. A BIG thank you to http://Nexo.io for being the title sponsor of the Security Token Series! Nexo is a blockchain-based overdraft system that allows users to make instant crypto loans. At the moment, there is no other way in which crypto owners can use their assets other than selling and buying them. Nexo comes forth with a very lucrative business model where it lets crypto owners use their holdings as collateral, then withdraw cash. The users maintain a 100% access to their cryptocurrency while they have immediate access to cash. Learn more about Nexo at http://Nexo.io . Also, thank you to our sponsors http://www.Unification.com for supporting the podcast via sponsorship and allowing me to improve the quality of content I bring to the audience. It is beyond appreciated. Timestamps 2:15 - Who are you and how did you get involved with crypto? 4:00 - What is RavenCoin? 5:40 - How does Ravencoin play into the whole security tokens market? 8:05 - Do you believe the Security tokens industry has massive potential? 9:30 - Why do you think this will be valuable? 17:38 - how does Ravencoin work and how can someone create an asset? 23:05 - Are people utilizing this to build tokens and how are they using it? 25:20 - Is this a complicated and long process to build a coin? 26:15 - What is Ravencoin’s connection to Overstock? 29:13 - How does the funding process for Ravencoin work? 32:50 - What is the overall focus of Medici Ventures? 36:00 - What are the new features you are adding to Ravencoin? 39:07 - What is the real benefits of these tags?